Telling the bees is a traditional British custom, in which bees would be told of important events in their keeper’s life, such as births, marriages, departures and returns in the household. The bees were most commonly told of deaths in their master’s family, including of their master. If the custom was omitted or forgotten then it was believed a penalty would be paid; the bees might leave their hive, stop producing honey or die. For a wedding the hive might be decorated and cake left by the hive. If the beekeeper died the hive would be draped in black and biscuits and wine from the funeral left for the bees. Today I took part in telling the bees at Dorset Road Allotments that their master, our Chairman and Head Beekeper, Clive, had died. Following his funeral at Beckenham Crematorium, Clive’s bees were told the sad news. 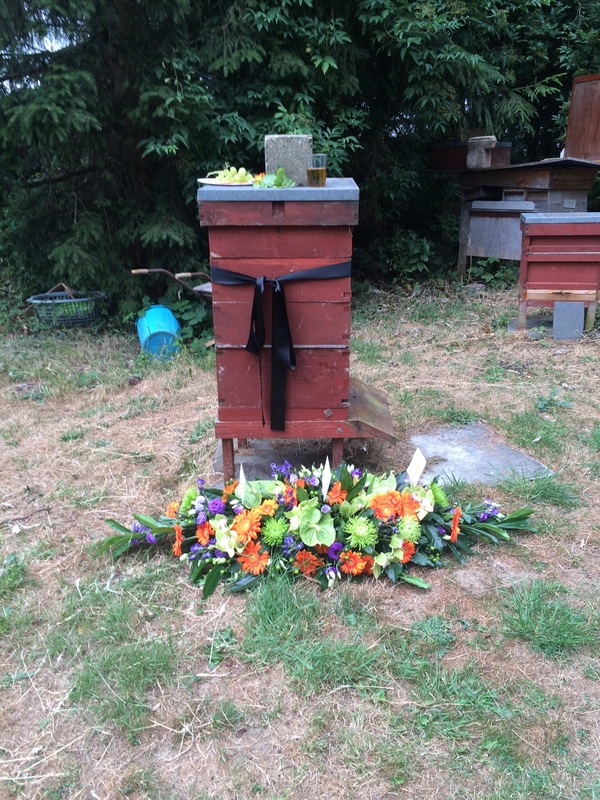 It was a moving ceremony attended by his family and many friends from the beekeeping community as well as the two allotments he worked so diligently for. Clive will be missed by all who knew him. Our condolences go to his wife Barbara and their family.